Currently, bisphosphonates are most commonly prescribed for the management of PMO., However, side effects and poor compliance to the currently available drug/s for PMO suggest a need for exploration of a new anti-osteoporotic product, also with a potential for fracture prevention. Dalbergia sissoo (Roxb ex DC) has shown anti-osteoporotic and fracture-healing activities in animal models of PMO. Safety of a standardized extract from leaves of D. sissoo (SEL-Ds) has also been established in a pilot clinical study. In view of unmet needs in the therapy of osteoporosis, we have evaluated the SEL-Ds in an open-labeled clinical study. The preliminary results of the registered clinical trial are presented in the current communication. A total of thirty women, postmenopausal between 45 and 69 years of age, were enrolled for the clinical study of 1-year duration. The study started in January 2017 and concluded in February 2018 at the menopausal health-care facility at a women's hospital, Hyderabad. This was a prospective, interventional, open-label, ambulant study that was registered at the Clinical Trials Registry of India (CTRI) (CTRI/2017/03/008105). Women were evaluated at baseline (visit 1) and then after 15 days (visit 2), 30 days (visit 3), 3 months (visit 4), 6 months (visit 5), 9 months (visit 6), and at the end of 1 year (visit 7). The clinical study was conducted as per the Good Clinical Practices by International Conference of Harmonization guidelines, Declaration of Helsinki, and national regulatory norms. The protocol was evaluated and approved by ISBEC, an independent Ethics Committee, and informed consent was taken from each woman before his/her enrollment in the study. Blood samples were collected in the morning, after an overnight fast of 12 h, by venipuncture via cubital vein. Samples for hemogram were collected in ethylenediaminetetraacetic acid (EDTA) bulb, for blood sugar in fluoride bulb and serum for routine biochemistry and for special markers in plain bulbs. Blood samples were centrifuged within 30 min of collection, and the plasma and serum were stored in separated aliquots at −70°C. Plasma samples were used for the estimation of TNF-α (Krishgen Biosystem, Worli, Mumbai, India). Serum samples were used for the estimation of high-sensitivity C-reactive protein (hs-CRP) (D. B. C., Diagnostic Biochem, Canada), levels by ELISA using Biotek spectrophotometer. All the samples of the respective visit were processed in a single assay in duplicate. Serum and EDTA plasma samples were stored in separate aliquots at −70°C. Samples were transported to a centralized laboratory on dry ice. A single GE Lunar Prodigy Advance dual-energy X-ray absorptiometry (DXA) machine was used to study the BMD. Anthropomorphic spine phantom was used as a daily quality control for the DXA machine. Major and minor discordances exist; thus, it is recommended to measure BMD in both the hips and the spine and classify patients on the basis of the lowest T-score. The DXA was conducted by a single expert technician, and her precision derived in terms of percent coefficient of variation (%CV) for lumbar spine was 1.1%, for femur neck was 1.9%, and for total hip was 1.66%. At the identified hospital, the study center, the least significant change (LSC) (LSC at 95% confidence interval = 2.77 × %CV) was 5.3% for neck of femur, 4.4% for total hip, and 2.8% for spine. In terms of the smallest detectable difference (SDD = 2 × standard deviation in g/cm2), BMD of 0.053 g/cm2 neck femur, 0.044 g/cm2 total hip, and 0.028 g/cm2 spine was derived. Women with menopause for at least 1 year were recruited. At baseline, these women had BMD by DXA scan with T-score ≥−2.5 and <−4, at hip and/or spine, serum calcium ≥8–10.5 mg/dl, phosphorus 2.5–4.5 mg/dl, and Vitamin D3 ≥15 ng/ml. Normal range of complete blood count (CBC), erythrocyte sedimentation rate (ESR), fasting blood sugar (FBS), total cholesterol (TC), triglyceride (TG), high-density lipoprotein-cholesterol (HDL-C), low-density lipoprotein-cholesterol (LDL-C), total bilirubin, aspartate aminotransferase (AST), alanine aminotransferase (ALT), alkaline phosphatase (ALP), serum creatinine, serum uric acid, and thyroid-stimulating hormone (TSH) as well as normal electrocardiogram (ECG) were ensured at baseline. Women with hemoglobin level below 10 gm%, debilitating illness and frailty, presence of any severe systemic disease, having consumed ayurvedic Rasayana drugs for long duration in the recent past of 3 months, on menopausal hormone therapy, on biphosphonates, Selective Estrogen Receptor Modulators (SERMs) (raloxiphene), tibolone, Parathyroid Hormone (PTH) analogs (teriparatide), calcitonin, strontium ranelate, or long-term use of anti-osteoporotic medicines in the recent past were excluded. Women with a history of stroke or unstable angina or myocardial infarction or cardiac failure in the recent 6 months were not considered. Women on glucocorticoids equivalent to ≥7.5 mg/day of prednisone or for >3 months' duration were excluded. Abnormal organ function tests, metabolic bone disorders other than osteoporosis, primary or metastatic bone cancer, bone infections, chronic renal failure, uncontrolled rheumatoid arthritis, ankylosing spondylitis, Type 1 diabetes mellitus, malabsorption syndrome, and chronic environmental/inherited diseases interfering with bone mineralization were all excluded. One capsule of hydroalcoholic extract of leaves of D. sissoo (300 mg per capsule) was given twice a day with supplement of calcium (250 mg) and Vitamin D (200 IU) twice a day. Each capsule contained phytoactive caviunin 7-O-B-D-glucopyranoside (2.5%), biochanin (2.46%), genistein (0.95%), and pratensein (0.21%). Purity of the product was ensured for heavy metal content, pesticide residue, microbial load, and aflatoxins contamination, as per the WHO guidelines. The investigational product was provided in a container suitably packed for the dose of a month, whereas calcium with Vitamin D was provided in a strip form. The primary outcome measures were to study the anti-osteoporotic efficacy of D. sissoo by DXA-scan. Total ALP, a cost-effective biomarker, is also useful for the assessment of osteoporosis. Decline in total ALP was in parallel with bone ALP (BAP) after bisphosphonate therapy, and ALP was considered acceptable alternative to BAP. TNF-α was assessed as an anti-inflammatory and osteoclastogenic marker. The secondary outcome measure for anti-inflammatory activity of D. sissoo was hs-CRP. All women were assessed, at every visit, for any change in their prerecorded baseline symptoms. Women were also assessed for any adverse event experienced during the treatment period. Pulse, blood pressure, body temperature, and weight were also recorded at every visit. Organ function safety was evaluated by CBC, ESR, FBS, TC, TG, HDL-C, LDL-C, total bilirubin, AST, ALT, ALP, serum creatinine, serum uric acid, urine routine, and ECG at visits V4, V6, and V7. To calculate the efficacy of the Standardized extract of leaves of D. sissoo (SEL-Ds) on the PMO women, the summary statistics has been used for change from baseline values along with the P value. P values are obtained after applying Student's t-test for the change from baseline values. The statistical significance was considered at P < 0.05. The null hypothesis was considered as there is no change in the values of the biochemical markers and a deterioration in the BMD over the period of therapy. Out of the 81 women screened, 32 were enrolled for the study as they satisfied the selection criteria. However, two women failed to report on V2 (15 days) and were considered as noninitiated women. A total of thirty women were enrolled, of which 25 women completed the 1-year study amounting to 80% adherence. Two women dropped out on V4 (90 days), one woman dropped from the study on V5 (120 days), and finally two women did not turn-up for V7 (1 year). These five women dropped out for various personal reasons and none had dropped for adverse event. [Figure 1] demonstrates the flow diagram for women's participation. Two among the five dropouts were available for blood test till V6. 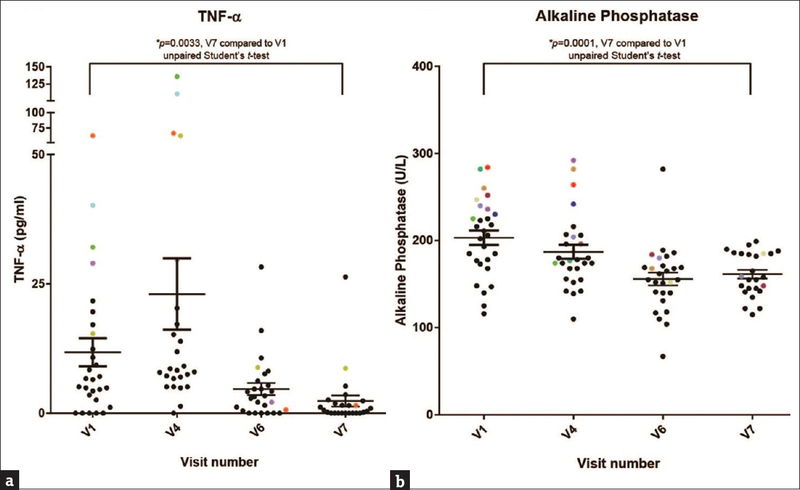 Their TNF-α and alkaline phophatase levels at V6 had shown decline (T14, ALP at V1 – 178 IU/L to V6 – 155 IU/L, TNF-α at V1 – 12.4 pg/ml to V6 – 3.21 pg/ml, T20, ALP at V1 – 260 IU/L to V6 – 168 IU/L, and TNF-α at V1 – 29 pg/ml to V6 – 2.14 pg/ml). The age range of the selected 30 PMO women was 45–69 years. Twenty-three of the thirty women had their menopause at ≥45 years of age. The remaining seven PMO had early menopause which was confirmed by elevated serum FSH. The duration of menopause more than 10 years was observed in 17/30 women. Median BMI of these participants was 27 (kg/m2), with a median height of 150 cm and a median weight of 61 kg. The baseline symptoms recorded in these thirty women could be grouped into four distinct clusters related to musculoskeletal, neurocognitive, gastrointestinal, and urinary tract in the order of its frequency. The baseline cluster of musculoskeletal symptoms (low-back pain [n = 23], arthralgia [n = 22], knee pain [n = 21], weakness [n = 18], fatigue [n = 18], myalgia [n = 13], inactivity stiffness [n = 12]), and upper gastrointestinal symptoms (low appetite [n = 11] and epigastric burning [n = 9]) had shown substantial reduction in >50% of these women on subsequent follow-up after therapy. 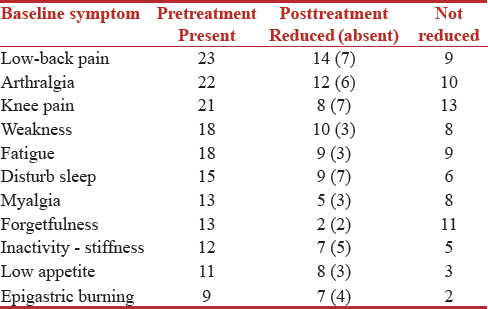 [Table 1] depicts the most frequently encountered baseline symptoms and their response to therapy. All organ function tests remained within the normal range throughout the study as well as pulse, blood pressure, body temperature, and weight did not show any significant change at all the visits. Serum levels of TNF-a have shown a marked decline in majority of the women as depicted by a scatter gram [Figure 2]a. The mean serum TNF-α levels declined from 12.04 ± 2.81 pg/ml (V1) to 2.35 ± 1.08 pg/ml (V7). Out of the 25 women who completed the 1-year study, the total ALP remained within the normal range although the observed reduction in 19/25 women showed an average reduction of 61.5 IU/L [Figure 2]b. The marker of inflammation-hs-CRP has shown a gradual reduction over the period of 1 year. The mean value serum hs-CRP declined from 6.1 ± 0.77 mg/L (V1) to 3.9 ± 0.47 mg/L (V7) as shown in [Figure 3]. DXA-scan-based BMD analysis of the LSC (vide-supra), at 6 months (V5), demonstrated that there was no deterioration in the BMD at lumbar spine in 15 women, at femur neck in 14 women, and at total neck in 14 women. Instead, there was an increase in BMD in five women at lumbar spine, six women at femur neck, and five women at total neck. Whereas, a decrease was noted in BMD at lumbar spine in three women, three at femur neck, and four at total neck. Two women were not included in the DXA reporting for technical reasons. However, at 12 months (V7), there was no deterioration observed in the BMD at lumbar spine in 15 women, 15 at femur neck, and 21 at total neck, i.e., 51/75 locations assessed. A decrease was found in BMD at lumbar spine in five women, two at femur neck, and one at total neck, i.e., 8/75 locations assessed. Whereas, there was an increase in BMD in four women at lumbar spine, seven at femur neck, and two at total neck, i.e., 13/75 locations assessed. One patient was not included in the DXA reporting for technical reasons. A high prevalence of PMO in India with an associated risk of fragility fractures is of great public health concern.,,,,,,, Though there may not be an exact prevalence rate for PMO in Indian women at large, the reported rates for PMO are not only high, but occur a decade earlier than in their Western counterparts. Hence, it is imperative to diagnose PMO early and start therapy in time so as to prevent fractures and other complications of PMO. Bisphosphonate group of drugs are currently considered as a preventive or primary line of treatment for PMO. However, their profile of frequent minor side effects and serious adverse reactions affects patient preference. Anti-osteoporotic drugs such as HRT, bisphosphonates, and parathyroid hormone have a negative public image and a poor long-term compliance due to large dropout rates.,, The latter are due to serious side effects such as acute-phase reactions, and others such as osteonecrosis of the jaw bone, atypical fractures with difficult healing, and cardiac arrhythmia. Estrogen treatment was considered as the other effective anti-osteoporotic pharmacological agent. However, HRT has restricted application after negative impact of WHI study outcome in 2002.,, As a consequence, there are unmet needs for new anti-osteoporotic drugs which are safe and effective and of natural origin. D. sissoo has shown anti-osteoporotic and fracture-healing activities in animal models of PMO. A pilot clinical study with a SEL-Ds given orally in a dosage form (300 mg/capsule, 2 capsule BD) has shown good tolerability, safety, and a potential for enhancing fracture healing. The present clinical study with Standardized extract of leaves of D. sissoo (SEL-Ds) was undertaken to explore its safety and activity for the unmet needs in the treatment of PMO. This study showed good tolerability and safety of Standardized extract of leaves of D. sissoo (SEL-Ds) given orally at the dose of 300 mg twice a day for 1 year. There was a marked elevation of baseline serum levels of TNF-α in the present study. Estrogen deficiency at menopause and during postmenopausal years increases the production of cytokine TNF-a by stimulating bone marrow-resident T-lymphocytes. This leads to osteoclastogenesis.,, Recently, it has been reported that TNF-a contributes significantly to PMO. The authors have shown that circulating levels of TNF-a were significantly higher in postmenopausal women with osteoporosis as compared to those without osteoporosis. Anti-osteoporotic effects of other agents have also been shown related to decline in the circulating levels of TNF-a during therapy., The decline of the mean serum TNF-α levels from 12.04 ± 2.81 pg/ml at baseline to 2.35 ± 1.08 pg/ml at the end of the study was statistically significant. The effect suggests a decline in osteoclastogenesis and as a consequence, a putative stabilization of BMD or its increase. Total ALP levels were elevated in these women of PMO. Some of these were at higher levels of normal range. Significant increase in the circulating levels of total ALP in PMO women has been reported.,, A simple blood test for total ALP may give an early warning of impending osteoporosis, which is considered to be a cost-effective marker of bone turnover. The declined levels of total ALP during therapy assessment can be considered adequate during the assessment of anti-osteoporotic treatment. The present study demonstrates a substantial reduction in the total ALP from 208.75 ± 45.88 at the baseline to 154.52 ± 37.25 IU/L at the end of the study. 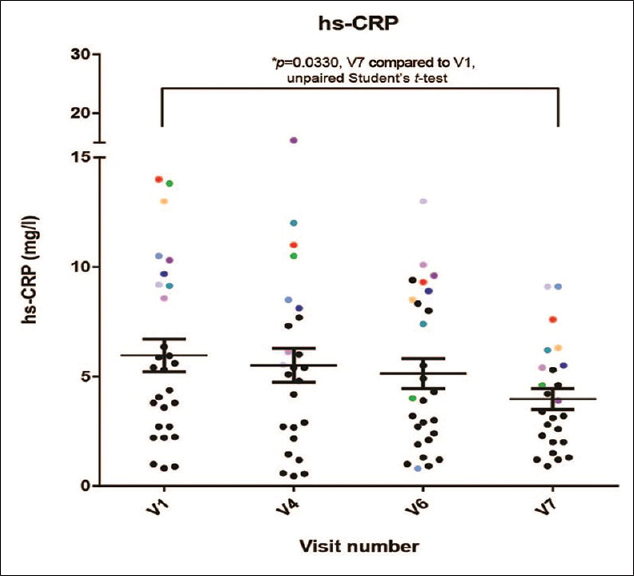 Circulating hs-CRP levels in the present study were seen elevated in a large number of postmenopausal women (n = 20). Others also have shown elevated hs-CRP levels in the postmenopausal women as compared to the premenopausal women. Association of high hs-CRP and osteopenia/osteoporosis with increased bone turnover has also been shown. The present study shows a downward trend in hs-CRP during D. sissoo treatment, indicating the anti-inflammatory effect of D. sissoo treatment. Mean values of hs-CRP 6.1 ± 0.77 mg/L at baseline have declined to 3.9 ± 0.47 mg/L at the end of 1 year. Additionally, the cluster analysis of the symptoms before and during the Standardized extract of leaves of D. sissoo (SEL-Ds) administration suggests anti-arthritic potential of the medication. In experimental in-vitro and in-vivo models of inflammation D. sissoo leaves extracts have demonstrated anti-arthritic activity. Whereas, in diverse animal models of inflammation, anti-inflammatory activity was reported without any adverse effects on the gastric mucosa. None of the women have shown any upper-gastrointestinal side effects over the period of 1-year therapy. It is interesting to note that seven out of nine women who had epigastric burning as a baseline symptom reported relief at subsequent visits. It is widely accepted that aging per se in postmenopausal women, without medication, leads to a steady bone loss of 1%–3% per year. Instead, in the present study, most of the women have shown not only no decline, but also improvement of BMD at three different locations. The concomitant improvement in clinical symptom profile from baseline and significant changes in the biochemical markers such as TNF-α, ALP, and hs-CRP makes this finding of nondeterioration or an increase in BMD pathogenetically plausible and confirmatory of the preclinical animal studies at CSIR-CDRI. One limitation of the study is the fixed dose used for all the PMO patients. This was done so as to follow a dose used and found safe in an earlier clinical study for fracture healing. However, the observed safety of the dose used for a year suggests the need to investigate a fixed-flexible dosage schedule in the future studies in larger samples. The escalation of the dose quantum or frequency can be based on the markers shown in the study such as TNF-α, ALP, and hsCRP. Longer duration studies in PMO and fracture prevention can be embarked upon after the optimal dose range is defined for both efficacy and safety. SEL-Ds has demonstrated anti-osteoporotic activity as indicated by the decline in the serum levels of TNF-α along with concurrent reduction in ALP. The nondecline in BMD index in the majority of women also substantiates the anti-osteoporotic activity. Anti-inflammatory activity of the product corroborates with the reduction in hs-CRP and improvement in cluster analysis of musculoskeletal symptom profile. The safety, at the present dose of D. sissoo (300 mg b. i. d.) for a year, was shown by the absence of adverse reactions and no deterioration in the organ function tests. We acknowledge the expert help of Dr. Jayashree Joshi for ISBEC monitoring of the study. We thank Dr. Nitin Kochar, Dr. Nutan Nabar (Ayurveda physicians), Dr. Lal Hingorani, (Pharmanza Herbals), Dr. Ritu Trivedi, and Dr. Naibedya Chattopadhyay (CDRI) for discussions on D. sissoo. Ms. Sashaina Fanibunda helped in plotting the graphs. We thank Dr. Deepak Dave, Sri Dhirubhai Mehta (KHS-MRC), Dr. Naunihal Singh, and Dr. Tanvir Singh (Tanvir Hospital) for their continued support. This study was financially supported by Pharmanza Herbal Pvt. Ltd.
Dr Ashwinikumar Raut has been a consultant to Pharmanza Herbal Pvt. Ltd.
Kadam NS, Chiplonkar SA, Khadilkar AV, Khadilkar VV. Prevalence of osteoporosis in apparently healthy adults above 40 years of age in Pune city, India. Indian J Endocrinol Metab 2018;22:67-73. Aggarwal N, Raveendran A, Khandelwal N, Sen RK, Thakur JS, Dhaliwal LK, et al. Prevalence and related risk factors of osteoporosis in peri-and postmenopausal Indian women. J Midlife Health 2011;2:81-5. Shah W, Sharma V, Srivastava RN, Pradeep Y, Mahdi AA, Santosh Kumar. Prevalence of primary post menopausal osteoporosis at various sites in Indian females. Int J Health Sci Res 2014;4:113-7. Das BG, Deb A, Chattopadhyay A, Basu M, Bhattacharya J. Prevalence and risk factors of osteopenia and osteoporosis in Indian women. IOSR J Dent Med Sci 2016;15:15-8. Cherian KE, Kapoor N, Asha HS, Thomas N, Paul TV. Influence of different reference databases on categorization of bone mineral density: A study on rural postmenopausal women from Southern India. Indian J Endocrinol Metab 2018;22:579-83. Khadilkar AV, Mandlik RM. Epidemiology and treatment of osteoporosis in women: An Indian perspective. Int J Womens Health 2015;7:841-50. Azuma Y, Kaji K, Katogi R, Takeshita S, Kudo A. Tumor necrosis factor-alpha induces differentiation of and bone resorption by osteoclasts. J Biol Chem 2000;275:4858-64. Cenci S, Weitzmann MN, Roggia C, Namba N, Novack D, Woodring J, et al. Estrogen deficiency induces bone loss by enhancing T-cell production of TNF-alpha. J Clin Invest 2000;106:1229-37. Rahnama M, Jamrogiewicz I, Jamrogiewicz R. Analysis of the influence of hormone replacement therapy on TNF-alpha serum levels in menopausal women. Postepy Hig Med Dosw (Online) 2012;66:1006-11. Thulkar J, Singh S. Overview of research studies on osteoporosis in menopausal women since the last decade. J Midlife Health 2015;6:104-7. Gambacciani M, Levancini M. Management of postmenopausal osteoporosis and the prevention of fractures. Panminerva Med 2014;56:115-31. Rossouw JE, Anderson GL, Prentice RL, LaCroix AZ, Kooperberg C, Stefanick ML, et al. Risks and benefits of estrogen plus progestin in healthy postmenopausal women: Principal results from the women's health initiative randomized controlled trial. JAMA 2002;288:321-33. Goldman JA. The women's health initiative 2004 – Review and critique. MedGenMed 2004;6:65. Vaidya RA, Pandey SN. Estrogen therapy/hormone therapy: Post women's health initiative study dilemma, debate, and emerging consensus. In: Vaidya R, editor. ECAB Clinical Update: Obstetrics & Gynecology Menopause. India: Elsevir, Gurgoan; 2008. p. 11-47. Lewiecki EM. Bisphosphonates for the treatment of osteoporosis: Insights for clinicians. Ther Adv Chronic Dis 2010;1:115-28. Alarkawi D, Ali MS, Bliuc D, Center JR, Prieto-Alhambra D. The challenges and opportunities of pharmacoepidemiology in bone diseases. JBMR Plus 2018;2:187-94. Bhutani G, Gupta MC. Emerging therapies for the treatment of osteoporosis. J Midlife Health 2013;4:147-52. Khedgikar V, Gautam J, Kushwaha P, Kumar A, Nagar GK, Dixit P, et al. Astandardized phytopreparation from an Indian medicinal plant (Dalbergia sissoo) has antiresorptive and bone-forming effects on a postmenopausal osteoporosis model of rat. Menopause 2012;19:1336-46. Dixit P, Pande S, Deshmukh A. Safety and efficacy of a standardized extract from leaves of Dalbergia sissoo in healing of long bone fracture: A pilot clinical study. J Complement Med Altern Healthc 2018;4:555651. Singh M, Magon N, Singh T. Major and minor discordance in the diagnosis of postmenopausal osteoporosis among Indian women using hip and spine dual-energy X-ray absorptiometry. J Midlife Health 2012;3:76-80. Quality Control Methods for Herbal Materials. World Health Organization; August, 2011. p. 187. Available from: https://www.who.int/medicines/publications/qas_herbalmed/en/. [Last accessed on 2018 Dec 27]. Mukaiyama K, Kamimura M, Uchiyama S, Ikegami S, Nakamura Y, Kato H, et al. Elevation of serum alkaline phosphatase (ALP) level in postmenopausal women is caused by high bone turnover. Aging Clin Exp Res 2015;27:413-8. Rizzoli R, Reginster JY, Boonen S, Bréart G, Diez-Perez A, Felsenberg D, et al. Adverse reactions and drug-drug interactions in the management of women with postmenopausal osteoporosis. Calcif Tissue Int 2011;89:91-104. Papapetrou PD. Bisphosphonate-associated adverse events. Hormones (Athens) 2009;8:96-110. Kennel KA, Drake MT. Adverse effects of bisphosphonates: Implications for osteoporosis management. Mayo Clin Proc 2009;84:632-7. Nanes MS. Tumor necrosis factor-alpha: Molecular and cellular mechanisms in skeletal pathology. Gene 2003;321:1-15. Zha L, He L, Liang Y, Qin H, Yu B, Chang L, et al. TNF-α contributes to postmenopausal osteoporosis by synergistically promoting RANKL-induced osteoclast formation. Biomed Pharmacother 2018;102:369-74. Huang Y, Cao S, Nagamani M, Anderson KE, Grady JJ, Lu LJ, et al. Decreased circulating levels of tumor necrosis factor-alpha in postmenopausal women during consumption of soy-containing isoflavones. J Clin Endocrinol Metab 2005;90:3956-62. Bhattarai T, Bhattacharya K, Chaudhuri P, Sengupta P. Correlation of common biochemical markers for bone turnover, serum calcium, and alkaline phosphatase in post-menopausal women. Malays J Med Sci 2014;21:58-61. Sri Rekha P, Venkateswarlu U, Sarada U. Comparative study of Biochemical bone turnover markers in pre & post-menopausal women. Int J Appl Res 2015;1:185-7. Suguna S, Jayrajan MP. Association of menopause with inflammation-sensitive protein C-reactive protein among the Indian women. J Evol Med Dent Sci 2013;2:10144-53. Koh JM, Khang YH, Jung CH, Bae S, Kim DJ, Chung YE, et al. Higher circulating hsCRP levels are associated with lower bone mineral density in healthy pre-and postmenopausal women: Evidence for a link between systemic inflammation and osteoporosis. Osteoporos Int 2005;16:1263-71. Amrutkar Y, Hajare SW, Ingawale MV, Bhojane NM, Madhuri H, Ingole RS. Anti-inflammatory activity of ethanolic leaf extract of Dalbergia sissoo in vitro and in vivo. Adv Tissue Eng Regen Med Open Access 2017;2:171-4. Hajare SW, Chandra S, Sharma J, Tandon SK, Lal J, Telang AG. Antiinflammatory activity of Dalbergia sissoo leaves. Fitoterapia 2001;72:131-9. Meeta, Harinarayan CV, Marwah R, Sahay R, Kalra S, Babhulkar S. Clinical Practice Guidelines on Postmenopausal osteoporosis: An executive summary and recommendations. J Mid-Life Health 2013;4:77-106.